Inspection is the examination done by looking at the body, which was checked through observation. Adequate light is necessary for nurses to distinguish colors, shapes and body hygiene clients. Focus inspections on any part of the body include: size, color, shape, position, symmetrical. And to compare the results of normal and abnormal body parts with each part of the body. Example: yellow eyes (jaundice), there is a goitre in the neck, bluish skin (cyanosis), and others. 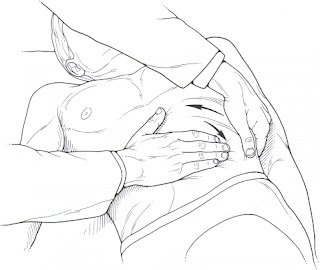 Palpation is a technique that uses the sense of touch. Hands and fingers are sensitive instruments used to collect data about, for example: temperature, turgor, shape, moisture, vibration, size. Create a comfortable and relaxed environment. Nurses should be in state hands warm and dry. Fingernails nurse, had to be cut short. All parts are palpable pain at the end. Ie, the presence of tumor, edema, crepitations (broken bones), and others. Percussion is tapping the examination with certain parts of the body surface to compare with other body parts (left and right) with the aim of producing sound. Percussion aims to identify the location, size, shape and consistency of the tissue. The nurse uses his hands as a means to produce sound. Sonor: percussion sounds normal tissue. Dim: percussion sound tissue, which is more dense, such as in the lungs in pneumonia. Deaf: percussion sound tissue, dense as on percussion area of ​​the heart, liver area percussion. Hipersonor / timpani: percussion sound more hollow areas, such as lung Caverna area, the client chronic asthma. The physical examination is done by listening to the sound produced by the body. Typically use a tool called a stethoscope. The things heard are: heart sounds, breath sounds, and bowel sounds. Rales: sound produced from the sticky exudate while subtle channels of respiratory expands on inspiration (rales fine, medium, coarse). For example, the client pneumonia, tuberculosis. Ronchi: low and very rude tone sounded both during inspiration and expiration time. Characteristic ronchi is lost when the client coughs. For example, in pulmonary edema. Wheezing: sound an audible "ngiii .... k". can be found in the phase of inspiration and expiration. For example, in acute bronchitis, asthma. 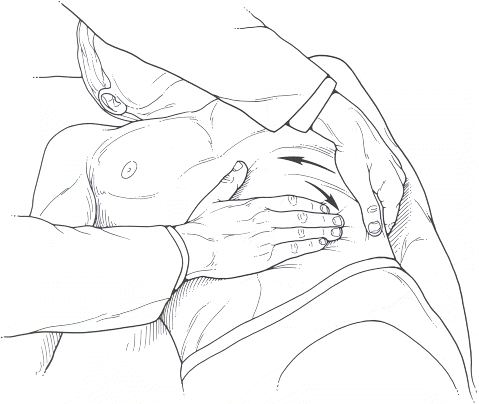 Pleural Friction Rub; sound that sounds "dry" sound like rubbing sandpaper on wood. For example, the client with pleural inflammation.